If you've allowed your Pro Tools Annual Upgrade and Support plan to expire, reinstate your Pro Tools Annual Upgrade and Support plan for a further 12 months. Get back on the plan that allows you to get Pro Tools releases and access to support from Avid. 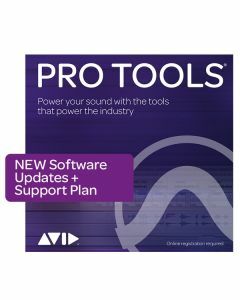 Avid Pro Tools Upgrade and Support plan for Pro Tools allows existing users of Pro Tools 9, 10 or 11 to upgrade to the latest version of Pro Tools. Avid now makes the latest revisions of the latest version of Pro Tools available to users with the Annual Upgrade Plan as they become available, with this plan you no longer have to wait for a big release to improve the way you work. Avid Pro Tools Upgrade Plan is valid for 12 months and renewable once it expires. Processor-hungry virtual instruments can impact system performance with plug-in-heavy mixes. And collaboration or project delivery to a client may require that you all have the same plug-ins used in the session. But no more. With Track Commit—a powerful and flexible precursor to the full Track Freeze workflow coming soon—you can render/flatten tracks to free up processing power and plug-in requirements. With tons of options that simplify the process for you. If you’re a sound editor or designer, precision and speed are paramount when it comes to aligning and editing clips. With Pro Tools 12.3, clips now take on a translucent appearance whenever you move and overlap one over another, giving you better visual clarity of their context. This enables you to align the waveforms of a new audio clip to the visual cues of an existing one’s waveforms with much better precision and ease. Fading tracks is one of the fundamentals of audio mixing. But it can be tedious and time consuming when editing thousands of audio clips. With new fade enhancements, you can speed through repetitious tasks and gain more time to focus on the creative aspects of your mix. Create presets for fade ins, fade outs, crossfades, and batch fades. Recall presets directly from your keyboard or control surface. And control fade settings independently when working with batch fades. All Pro Tools subscriptions, upgrades, and crossgrades now come with a new All Access plan. With the All Access Upgrade and Support plan, you get access to all new Pro Tools releases and expert help throughout your annual plan or subscription, plus access to an amazing bonus collection of high-quality effects and sound-processing plug-ins—at no additional cost. Or choose a lower-cost Annual Upgrade Plan and get all upgrades for just $99/year. And if you later decide you want access to the bonus plug-ins and support, just add the new Annual Plug-in and Support Plan for $99/year. Work with even more advanced tools right in Pro Tools. Mix and control groups of tracks faster and easier with VCA Masters. Mix with confidence using 17 advanced metering options, including K-system, VU, and other professional standards. Get gain reduction metering on every channel to gauge dynamics. And get smoother performance and highly responsive recording and playback with the extended Disk Cache feature, which loads entire sessions into RAM—no matter how large. With support for our free new Pro Tools | Control iOS app, you can wirelessly control Pro Tools and other EUCON-enabled audio and video software, freeing you from being tethered to your workstation. Because Pro Tools tightly integrates with the app, you can record and mix faster and easier than working with a mouse and keyboard alone. And we’ll say it again—it’s free! Get the sounds of some of the most coveted classic stompboxes with access to 16 stompbox effects plug-ins—available to Pro Tools and Pro Tools | HD users, exclusively through your All Access Annual Upgrade and Support Plan, Annual Plug-in and Support Plan, or Pro Tools subscription. From realistic emulations of the Pro Co Rat, Ibanez Tube Screamer, and Big Muff Pi distortion pedals, to the unmistakable sounds of the Cry Baby wah and Leslie rotary speaker, these incredible vintage sounds are available, right in Pro Tools. And they can be used to enhance any type of track—not just guitars. Rehearse and record more easily with track input monitoring. Dial in cue mixes in a snap by copying fader settings to sends. Create bigger mixes with support for up to 128 simultaneous audio tracks. Expand your musical creativity further with support for up to 512 instrument tracks. Solo tracks in PFL (pre-fader listen) or AFL (after-fader listen) mode for optimal recording.